Hazardous Level: Earwigs are non hazardous to humans. Earwigs did not get there name from an insect that crawls into your ear and lies eggs or eats your brain. This is an urban legend that first gained momentum in 1795. Multiplication Level: a female earwig lays broads of 300 eggs, twice a year. The most common Earwig in Canada is the European Earwig. It has forcep like appendages at the base of the abdomen. the body measures 12 to 26 mm. Males are larger than females. Colour ranges from reddish to dark brown. Earwigs are mos commonly seen in the summer months. Earwigs are nocturnal and are most active at night. Earwigs prefer dark and moist habitats such as under boards, debris, rugs, cushions, damp crevices, and especially in basements. No. Earwigs have forceps that look dangerous but will cause nothing more than a slight pinch. Spotting an earwig when you pick up a book or a toy off the floor can be surprising, but it's doubtful that shock will prove fatal. (although do note that even the manliest man will squeal in fear at a surprised sighting of an earwig). The female earwig lays broads of 300 eggs, twice a year which hatch in about 3 months. An infestation can number in the thousands. If I have an infestation of earwigs what can I do? It is recommended to seek the services of a trained Pest Control Professional to eliminate pests for the best results. 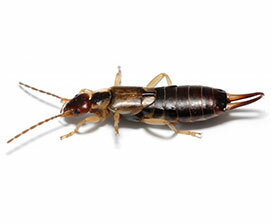 Anypest knows where earwigs hide, and we know how to prevent the spread and breeding of earwigs.